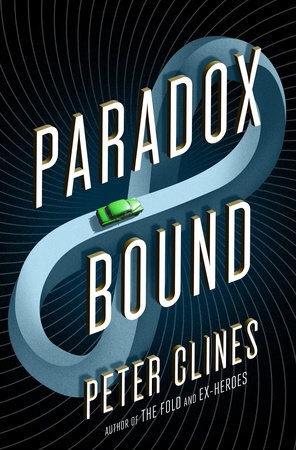 Paradox Bound is the latest novel by Clines and follows a boy who grew up in a small town in Maine. Through the course of his life, this strange woman kept popping up now and again, never aging and always with an old antique car. She looked like she was from another time, standing there in her revolutionary war attire, and it turned out, she was. This is now the third novel I’ve read by Peter Clines and this is by far my least favorite. It had some quaintness too it, and some moments I liked, but by and far I felt the novel was very predictable in how it approached the main storyline and filled with holes in some of the interactions with the minor characters. Eli, our main character has grown up in his small town, and never made his escape when he became an adult as much as he claims the desire too. He works at a dead end job, and does nothing of merit. So when he meets this strange woman, one he has had chance encounters with all his life and has fallen in love with through their brief interactions, he chooses to help her. This brings him in contact with the faceless men. Men who have given up their identities and had their faces removed to protect the American Dream. These men now have their sights on him as they feel he knows more than he is saying as they are after the woman. So of course, Eli now realizing that the strange woman is in danger, races after where he knows she will be, thus thrusting them into an adventure as they run for their lives. The faceless men always at their heels as they barely escape them at every turn.